"The rainy season is about to end. 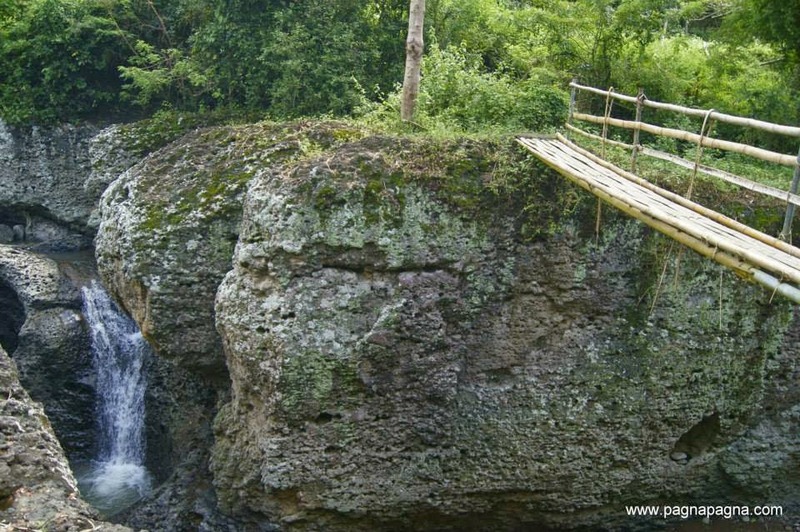 Here is one of Sudipen, La Union's waterfalls that i got to visit." Lately, as an artist, i don't have that much exercise as i only sat down and work on my oil painting of Tangadan Falls. 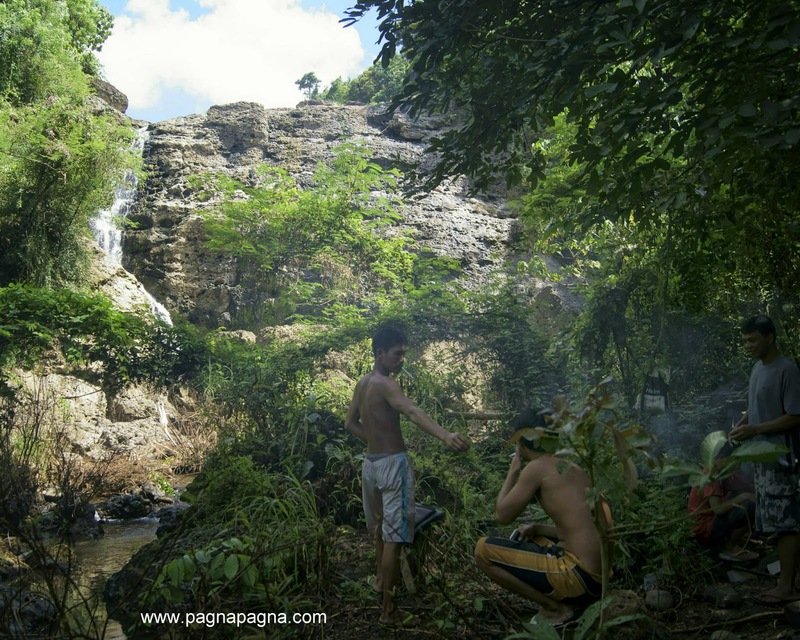 Going to Kinmadilyan Falls would be an easy task if i ride on public transport all-the-way because it is just a few meters walk from the road. So as to pump up those muscles, I decided to walk my way from the national highway until the Kinmadilyan Falls. 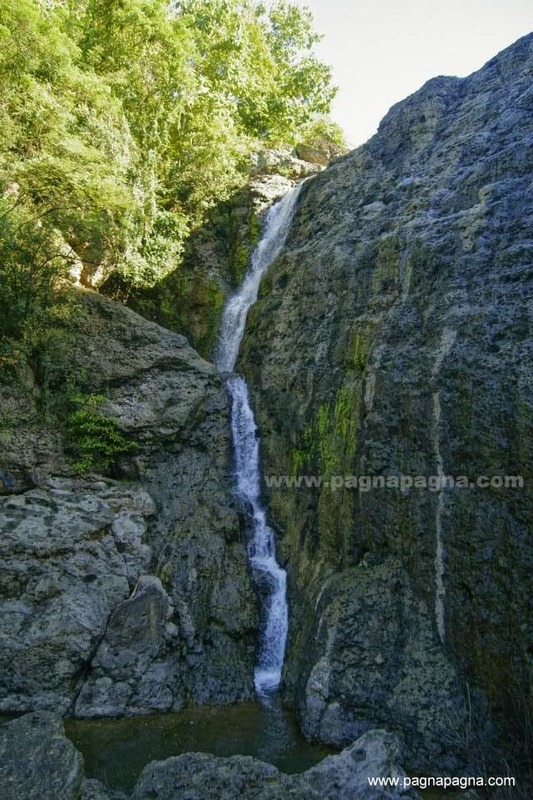 This is my second time going to Kinmadilyan Falls. Please practice the leave no trace outdoor ethics when going to these nature places. Let us not vandalize, put graffiti on their rocks and stone walls. Manage and dispose our waste products properly. If you find this story/blogpost interesting and/or had helped you in any way (in your researches, works, travels, blogs, adventures, homeworks at school, a personal project and more), I'd like to hear a word or two from wonderful people like you or simply Like "pagnapagna" in Facebook. I'd be very thankful. It gives me inspirations. Cheers! I stepped down from the mini-bus i rode on at barangay Pantar, Balaoan, La Union and walked my way at a road going towards east (6:22 am). Few meters from the national highway on that road, i went to eat "pancit" at a sari-sari store nearby and bought two boiled eggs which i am going to eat later. 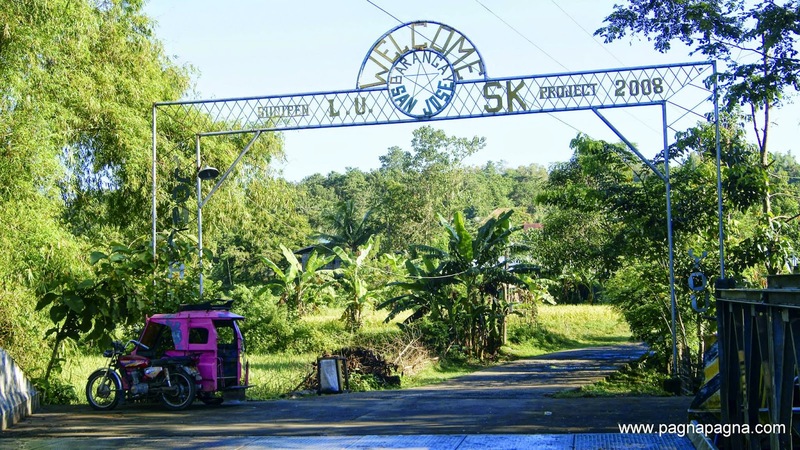 I continued walking, passed some few barangays of the municipality of Balaoan, La Union and finally passed by the Welcome arch of barangay San Jose (7:16 am) which is now in the municipality of Sudipen still in the province of La Union. Walked farther, passed by the barangay San Jose proper where the barangay hall is located, passed by a piggery (7:43 am) and a small cemetery (7:58 am) where just after it was a branching road going towards the left. I walked on that one-lane cemented road that ended into an earth road going near the waterfalls area as well as farmlands. From the earth road, i walked on a trail going to the base of the waterfalls below. There it was the Kinmadilyan Falls (8:07 am). I put down my backpack and took photos and videos of the waterfall. Afterwards, I decided to wait for the sunshine to strike the rock face wall to get a better lighting on my photos and videos. While waiting, i ate the two eggs i bought earlier. Later on, some people came, they put down their water container and some other things as they went farther down the creek catching something under the rocks. I just waited for them to come back near where i was as i continued taking photos of the waterfalls by climbing the boulders that happened to be at the base of the waterfall. Few minutes later, they got near where i was and i got to talk to them. 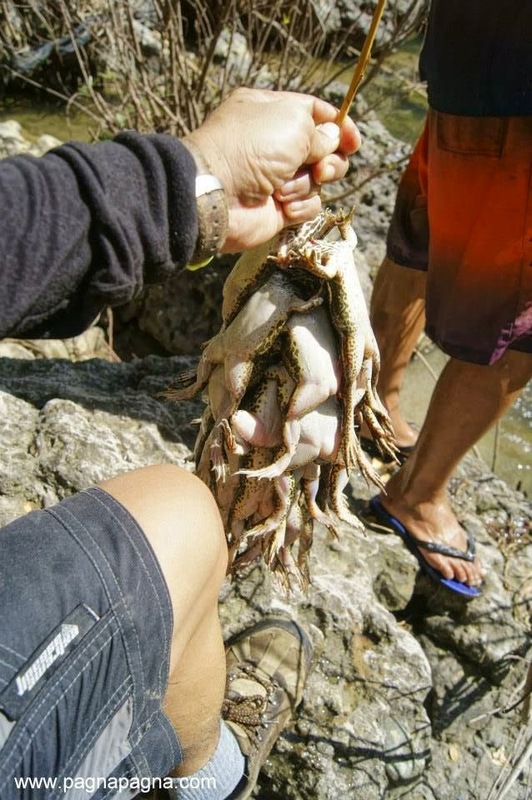 One of them was holding an array of frogs which caught my eye and i asked them if i can have a photograph of it. He willingly displayed it for the camera. I also got to get photographs and videos as they went catching frogs under the piles of rocks. They also caught some few crabs and crayfish. Afterwards, some of them went cleaning the frogs (removing innards) while the others went to get firewood and another one cooked rice. I can't stay there for a long time (I got other plans for that day) and decided to go up at the waterfalls through going back to the trail and continued walking on the road towards the farms. On top of the waterfall, i can see them below having their picnic. I did sat there for a while and afterwards i went back to the road and walked my way back under the scourging heat of the sun (11:18 am). I finally got a tricycle ride (11:59 am) going to the national highway where i rode a mini-bus going back to Home Sweet Home. From Manila, ride a bus going to these North and Northwestern luzon areas : Laoag City (Ilocos Norte), Vigan City (Ilocos Sur), Candon City (Ilocos Sur), Bangued (Abra) but you have to get down at Balaoan, La Union particularly at Barangay Pantar Norte Welcome Arch which is located along the national highway and its about some few minutes after Balaoan, la Union town proper. At the Welcome Arch, ride a tricycle going to barangay San Jose and ask direction at the Barangay Hall or to the tricycle driver itself. © All original content copyright sparkPLUG, 2012-2014. Please ask permission for content use.